Content by Tony Macklin. Originally published on October 30, 2013 @ tonymacklin.net. 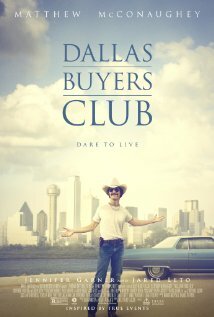 Based on an actual man's life, Dallas Buyers Club could be a Lifetime movie. It's the somewhat convoluted tale of a sleazy, homophobic reprobate - the late Ron Woodroof - who undergoes a life-changing crisis, and because of a fierce commitment to self-preservation, eventually becomes humanized. Hello, Lifetime Network calling. In a Dallas hospital in 1985 because of an accident, Woodroof was diagnosed HIV-positive, which was a death sentence. Woodroof was placed in a double-blind AZT trial, and surreptitiously got the real drug, but it weakened his immune system. In desperation, he went outside the Establishment to seek illegal means to try to fight his illness. He discovered experimental AIDS treatment in Mexico, and smuggled medication, not approved by the FDA, and alternative drugs into the the US. He set up a Buyers Club in Dallas to sell the drugs to the afflicted. Woodroof was very much a businessman. "Big Pharma" and the government tried to ruin him. Dallas Buyers Club became a fight to the death. Dallas Buyers Club has some coy dialogue at the beginning that wouldn't pass muster on a mediocre tv show. Cowboys at a rodeo see a newspaper headline announcing the revelation that Rock Hudson has AIDS. One cowboy asks, "Who is Rock Hudson?" He's no Ted Cruz, but even cowboys in Texas knew the name Rock Hudson. Then another adds, "Did you ever see North by Northwest?" Dallas Buyers Club is off to a very bad start. But what vaults Dallas Buyers Club out of indie hell and Lifetime purgatory is the splendid acting. The performances by Matthew McConaughey, as Woodroof, and Jared Leto as Rayon, Woodroof's transgender, business partner, are palpable and memorable. Both actors immersed themselves into their characters. There's been much made of McConaughey's loss of nearly 40 pounds to create gauntness and emaciation caused by the character's illness. McConaughey is a brash Texan like Ron Woodroof was. He spent a lot of time studying Woodroof's voice on tape. He captures an earthy, reckless anxiety. Leto also lost substantial weight for his role as Rayon - the vulnerable, but smart, HIV-positive, transgender, drug addict. Leto even wore woman's clothes off the set in public. McConaughey is on a remarkable streak of challenging, creative performances. Leto has been away from acting for years. Leto comes back as a lion - or lioness. Both McConaughey and Leto will secure Oscar nominations. But McConaughey has the most serious competition in years for Best Actor. If Leto has effective promotion, he should win the Oscar as Best Supporting Actor. He's one-of-a-kind dazzling. Both Jennifer Garner, as a caring doctor, and Griffin Dunne, as an expatriot drug experimentalist, add grace and credibility. Director Jean-Marc Vallee helps his actors transcend the well-meaning but limited screenplay by Craig Borten and Melisa Wallack. You keep expecting more punch. Dallas Buyers Club is a film where you keep expecting the worst. But it doesn't happen. Fate torments the characters, but it doesn't destroy them. Writing may not matter much in movies anymore, but acting still does.